Check out 2018 Maruti Suzuki Swift 5 Exclusive Facts! It’s coming with new Z+ trims; will be the most fuel efficient car in India. With the announcement made that 2018 Maruti Suzuki Swift will be launched at the Indian Auto Expo 2018, starting this 7th February in Greater Noida, the car buyers are now peeking at the Maruti Suzuki dealerships to know more details about the car. 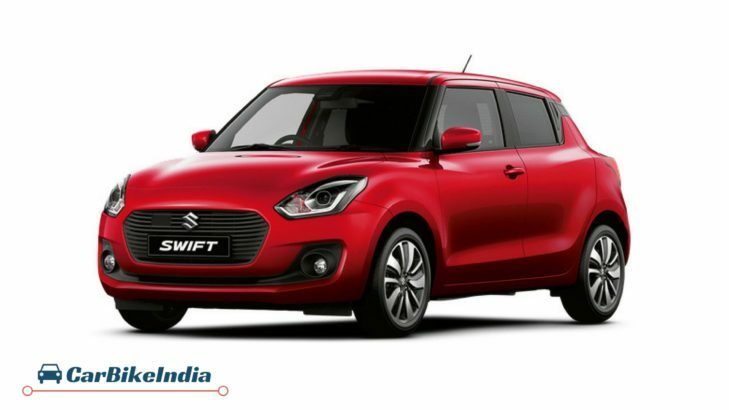 Already, the auto-giant, Maruti Suzuki has officially announced the bookings of Maruti Swift 2018. Buyers can now pay a sum of Rs. 11,000 and book the New Swift. With all this being not a mystery now, we have come up with the 5 best Maruti Swift 2018 details that you need to know as a buyer, check it out! Other than the usually heard L, V and Z trims, the upcoming 2018 Maruti Swift will get a new Z+ trim added in the lineup. This means that you will see the new Swift with the ZDI+ and ZXI+ variants that will offer some premium features like DRLs, Projector Headlamps, Smartplay touchsreen infotainment with Reverse parking display, Automatic headlamps and Precision cut alloy wheels. Long awaited consumers’ wish comes to an end. Finally, the Swift 2018 buyers will now be able to buy the car with an automatic transmission incorporated inside. The company will introduce the New Maruti Swift with an Automatic Manual Transmission (AMT) or Auto Gear Shift (AGS). The best part is that the automatic gearbox will be offered in the V and Z trims of the car, and that too for both the petrol and diesel engines. Compared to the outgoing model, the all-new Swift will be totally different in terms of looks. It will feature an all-new exterior, inspired from the sedan sibling, the new Dzire. Outside, everything is been remarkably done by Maruti Suzuki to make it one of the most appealing hatchbacks in its segment. However, unlike the Dzire, the front grille comes without the chrome. But the lower portion of the bumper is being smartly tweaked to make it appear more like a sporty hatch. The swept back headlights are as appealing as its redesigned tail lamps. And the introduction of LEDs, both on the front and rear lights is no doubt the icing on the cake. Let’s not forget, the top end trims are to come with the projector headlamps, another great feature outside! Inside too, there is a lot of rework done by Maruti Suzuki to tease the rivals like Hyundai Elite i20 and Hyundai Grand i10. You will find the same ambiance as the Dzire sedan, except the all-black theme. The comfort levels are being very well raised by making the seats better in thigh and lumbar support. The quality of the materials inside, be it the dash plastics or the upholstery, aren’t compromised either. Like the Volkswagen Polo GT, this one’s got the flat bottom steering. There is no question against 2018 Maruti Swift’s kitna deti hai factor as it takes the title of being the country’s most fuel efficient car along with its sedan sibling Maruti Dzire. The Maruti Swift 2018 will have the ARAI fuel efficiency of 22 kmpl for the petrol engine and 28.4 kmpl for the diesel engine. The 2018 Maruti Suzuki Swift is anticipated to come in the price range of Rs. 4.80 lakh to Rs. 7.47 lakh (Ex-showroom New Delhi). Stay tuned to CarBikeIndia for all the 2018 Swift updates!